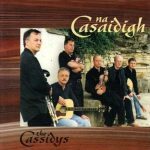 Na Casaidigh or The Cassidys are an Irish traditional group. They have been based in Dublin for many years, but they originally hail from Gweedore, County Donegal. The group consists of brothers Aongus, Seathrún, Ciarán, Fionntán, Feargus, and Odhrán. Irish is their native tongue and they had to study English as a second language during their school years. Their lyrics are mostly in Irish.